Hi everyone. Wow, what a difference a week makes! I feel like this Friday we finally banished a month or so long "dry spell" at the thrifts. I know that we still found quite a bit of stuff in those 4-5 weeks, but it just felt easier this weekend. So, starting at left - an interesting "Pyrex"-labeled black ceramic canister for utensils. I think this might be new, but it was just too fun to pass up. Next to that is a Pyrex "Hostess" yellow #525 square serving bowl. I probably should've passed this up since we have one already, but I was in a greedy thrifting mood. 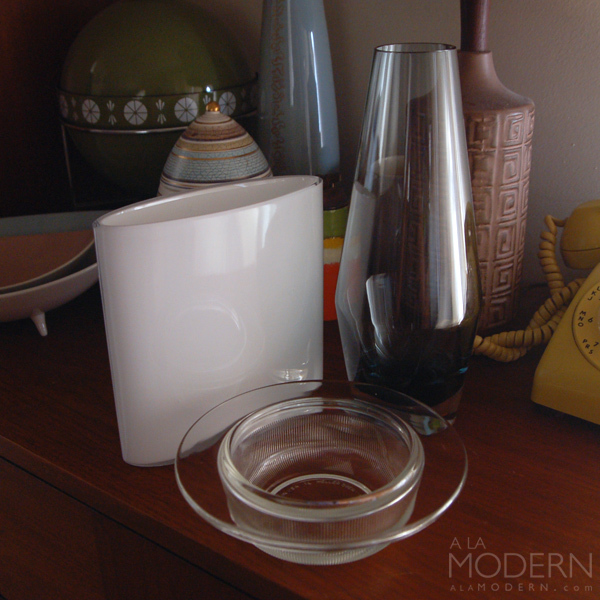 Next to the Pyrex bowl in the back is a Zanesville "Stoneage Modern" large vase. 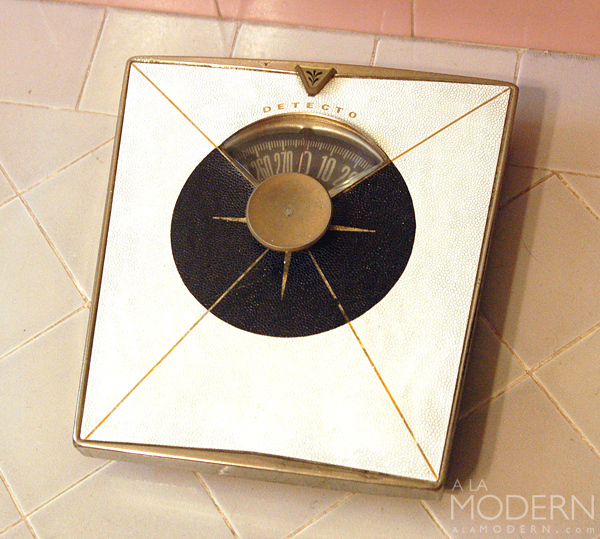 These aren't terribly valuable (yet), but they're popular with the mid-mod crowd. And the best thing is that they often aren't marked, so you can pick them up for cheap at thrifts. Below the AD plate are two Dansk cast iron Quistgaard candleholders. These are actually made in Taiwan, leading me to believe they're from the 70s-80s. I still couldn't pass on them because they were marked "JHQ", and I rarely see these type of cast iron Dansk items. The little cup and saucer to the left of those candleholders are from Upsala Ekeby. I pretty much will buy anything from Upsala Ekeby, but I'm not sure about the pattern on this set. It seems to say "Percy", but it didn't seem to match the ones I found online. Anyone know? 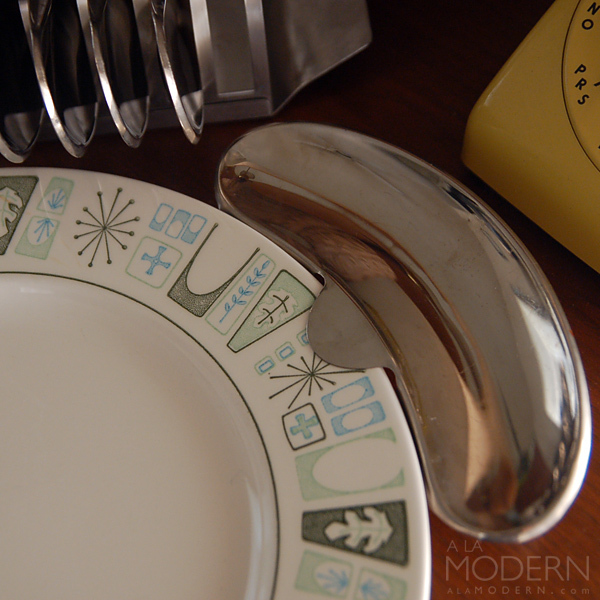 To the left of the UE cup and saucer is a familiar sight here on A La Modern - another Emalox bowl. These Norwegian enamels are fairly popular with our customers, and I grab pretty much any that I see as long as the condition isn't too bad. I was pleasantly surprised to find the Waechtersbach apple jar next to it. To be honest, I was surprised this already hadn't been scooped up. I've only found one other Waechtersbach covered jar so far at thrifts. To the left of that is another Taylor & Ng mug featuring a family dining at home. This one isn't as interesting as the usual ones, but still it's Taylor & Ng which does fairly well for us in our Etsy outlet. I have a few single pics as well - these bulb shakers from Japan are from last week. 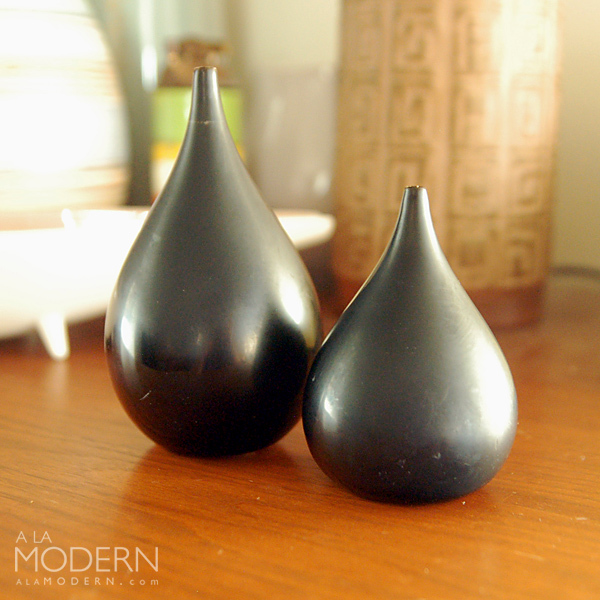 They're black lacquer on wood - they remind us slightly of some of the Laurids Lonborg pieces. 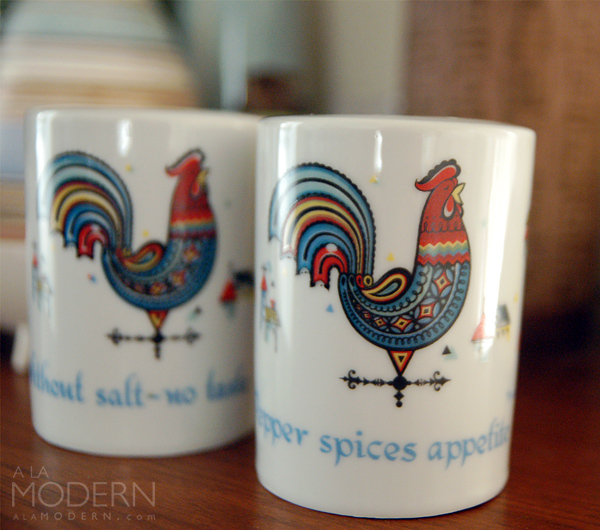 They're really sleek and chic, looking almost like pieces of art rather than shakers. 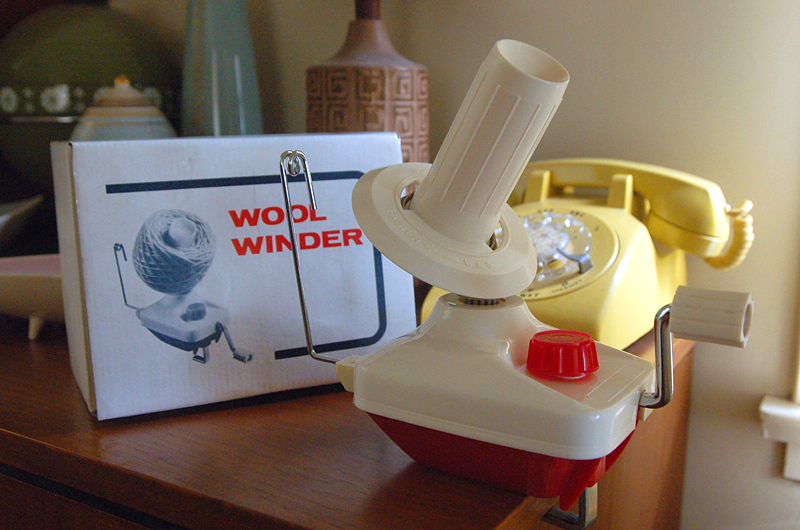 I picked up this older yarn/wool winder for Linda, even though she already had one. It was just in perfect condition and the price was just too good at the estate. Interestingly, this one has both English and Japanese writing on it. This white enamel canister is a mystery to me. I originally picked it up because I thought be some sort of Arabia or Finel piece. The illustrations of cars are really nicely done, but the "Tabac" label on it seems to point to it being a tobacco container? 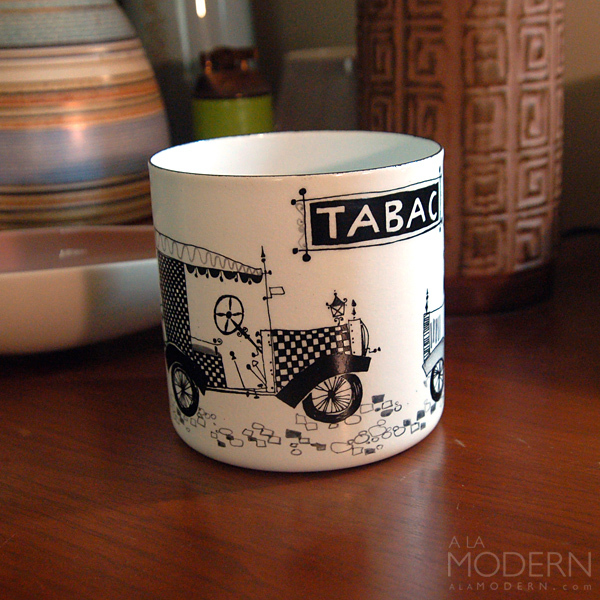 (Tabac is French, I think) Has anyone seen these illustrations or the canister shape before? I'm really glad I decided to take a day off from working on the house to go thrifting. It just goes to show that you never know when your luck might change. Happy thrifting! Hi everyone. I hit up our city's "Garage Sale" last weekend. You may have one of these for your city - a few times a year, they basically let anyone who lives within the city sell junk at the park, or other gathering place. Ours had a good showing this year 70-80 vendors - this kind of sale can be a good place to snag some midcentury and vintage goodies. Or, you can find nothing! That happened to me last time. 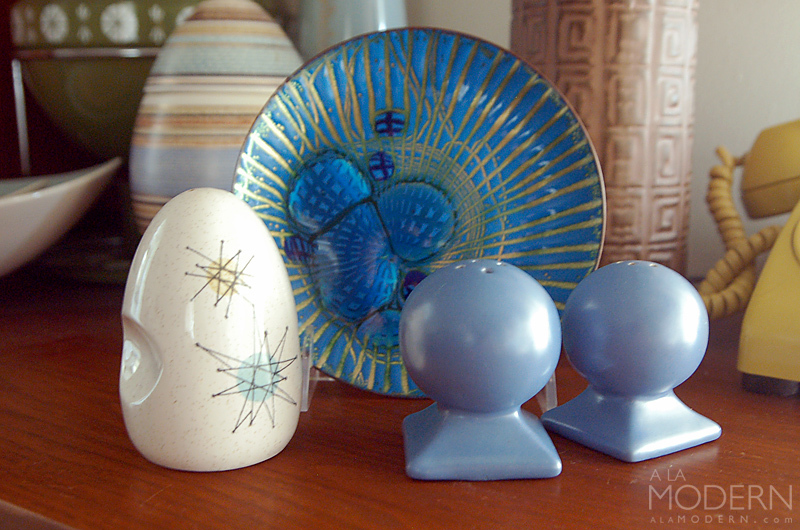 This time I got lucky and found an Annemarie Davidson enamel, two Padre Pottery art deco style shakers from the 40s and a lone Franciscan Starburst shaker. Probably the best finds I've ever had at a city Garage Sale. Later on in the week, I came across a large amount of glass items at a Goodwill that NEVER has anything good. I jokingly call it the Badwill... but for some reason, this time they had: a white Tapio Wirkkala for Iittala "Ovalis" vase, a familiar conical Tamara Aladin for Riihimaki glass vase (we found one of these earlier) and a small Vignelli Heller bakeware ramekin or individual casserole. I actually found three of the latter, and was excited because these weren't listed in the writeup from the New Glass book we'd found earlier. 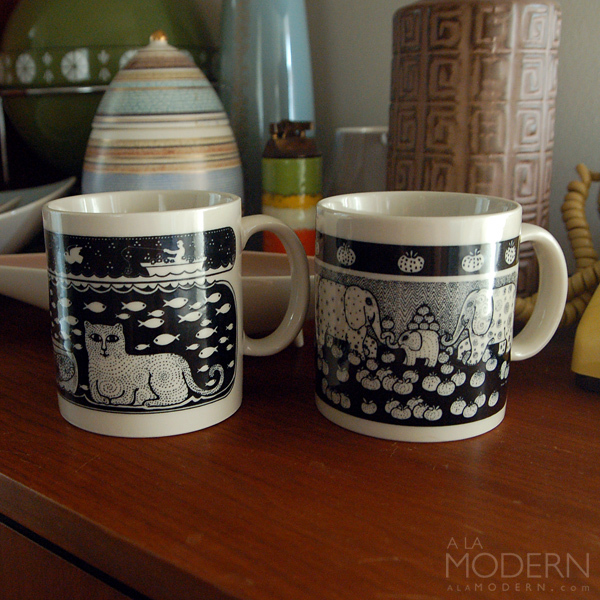 I also picked up these Taylor & Ng "Primitives" mugs at that same Goodwill. These are older, and have only a circular imprint of "Japan" on the bottom. The cat/fish one is one of my favorite Taylor & Ng pieces so far, even though I know it's been re-made. These Berggren Trayner large barrel shakers were an estate pickup. I'm never sure of the age on these pieces, but they're fairly popular so I usually grab them if reasonable. 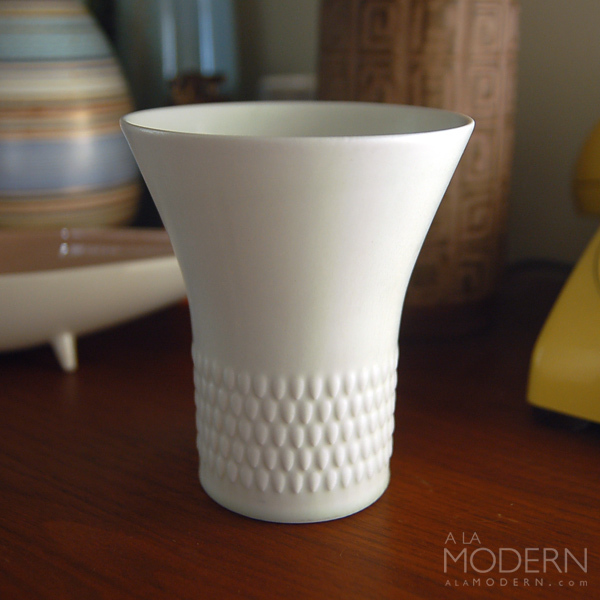 I picked up this white Rorstrand of Sweden vase in the "Pyrola" line at a random tiny thrift store. 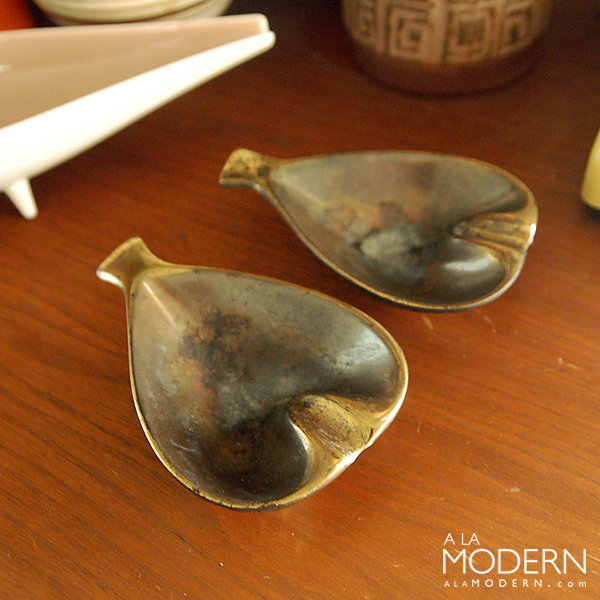 I haven't been able to find out much about these items, but I know they had several differernt shapes of vases and covered candleholders(?) in white and blue. A few places attributed it to Gunnar Nylund, but I didn't see any hard evidence yet to back that up. The estate I hit today had a sort of "back to school" theme going. 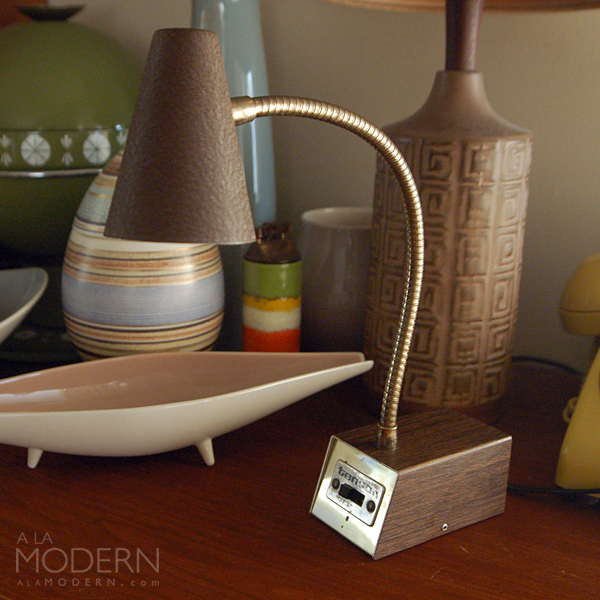 This is a Tensor "Student Lamp" model 7200 which is very similar to one we had sold earlier. Unfortunately, someone had rubbed the metal tag to clean it and the writing started to come off. Erm... that "someone" was actually me, oops. 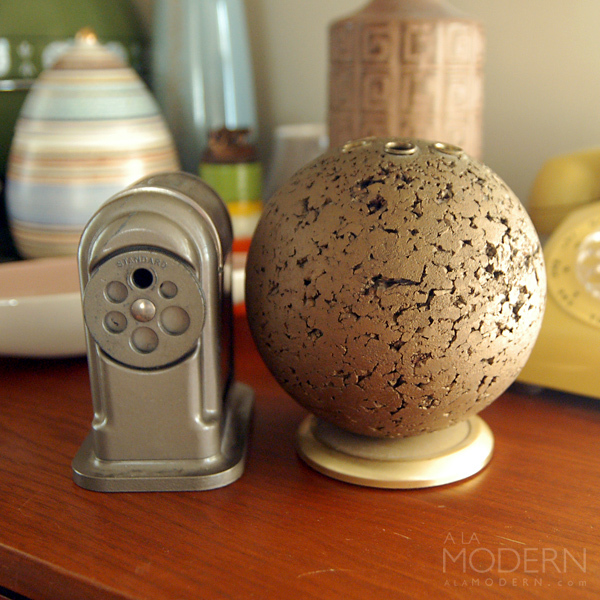 I also finally found one of those mod cork ball pencil holders. This one is spray painted gold - kind of weird, but I just had to pick it up. I haven't decided yet whether to keep it for the office or put it in the shop. I'm not sure yet, but we may skip a thrift post next week. It depends on the new house (we're almost up to doing interior paint), and if we have time to get out to the thrifts. Hope you have a good thrift week! Hi everyone. I've gotten smarter with preparing these thrifting posts. I usually start taking thrifting photos in the middle of the week, or at least on Friday after I get back from the thrifts. While that can mean doing more work after 5-6 hours of thrifting (and washing, cleaning, recording items), it sure makes it easier to write something up on the weekend. I also sometimes take a full set of product pictures and process them so items are ready to list whenever we get a chance. Oh - regarding thrifting. I know that sometimes it seems like we're complaining about not finding stuff, even though we DO find stuff. The thing is that we set the bar pretty high for ourselves. When we don't find a lot of great things, sometimes I feel it's more our fault rather than the thrift store's fault. As thrift resellers, we should be be able to adapt and look for things out of our comfort zone (easier said than done, I know). I don't get to thrift as much nowadays, but when I do, I go all out. 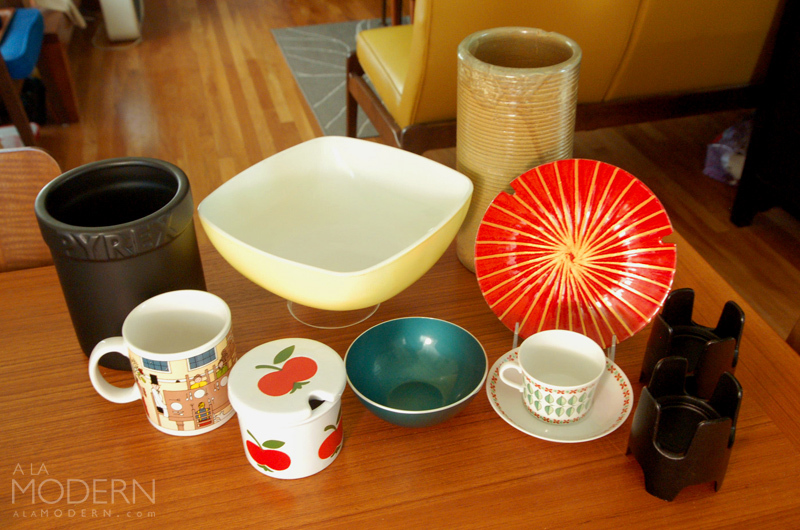 The items you see in each thrifting post are the result of visiting maybe 8-10 thrift stores and 1-2 estate sales. So, if I say I'm bummed out coming home with only a few things, it's because I went to so many stores. 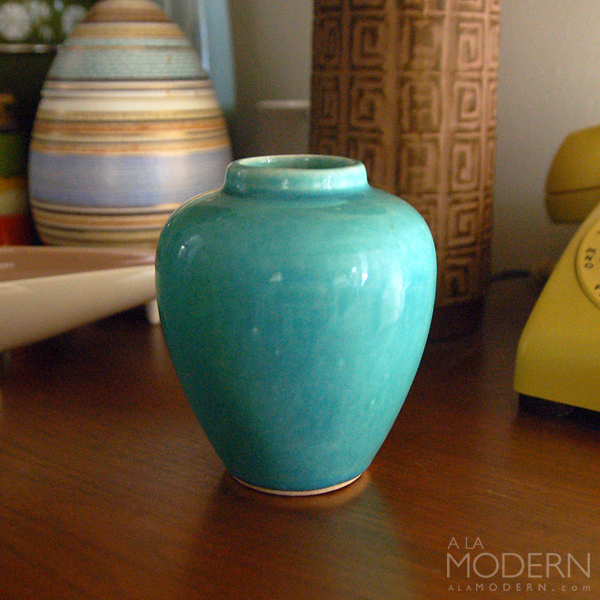 I thought this nice little McCoy vase might be a California piece at first. But I recognized the "NM" mark on the bottom. Haven't found out too much about it, but have seen a few others with similar style. These Ken Edwards pieces seem to do all right in both shops for us. I hadn't seen a double handle cup (perhaps a soup?) before like this one. The thrift was just putting it out so I grabbed it. 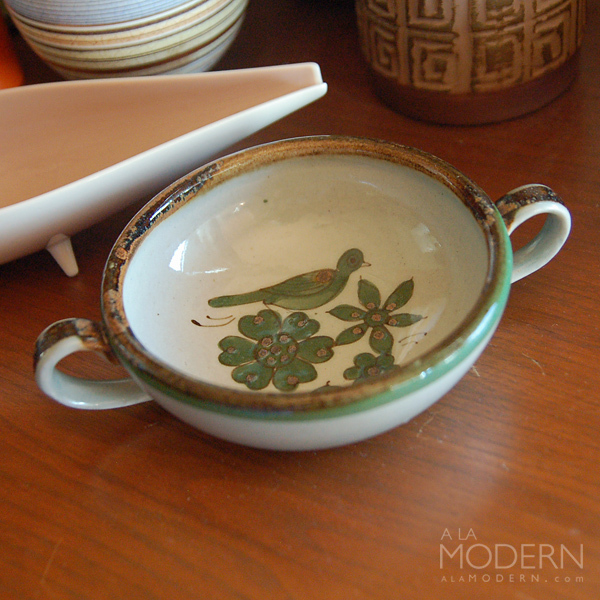 Last weekend, I hit a flea market and the only thing I came home with from the entire trip was this single Dorothy Thorpe dish. I actually almost passed on it, but it had an interesting double sticker on it, and was fairly reasonable. I don't know what the store "Bells - Fashion Square" was or is. 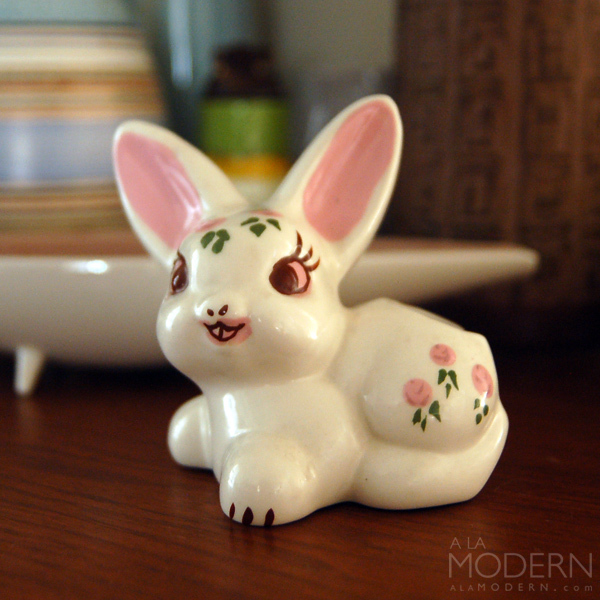 I wasn't sure if this cute rabbit planter was California pottery, but it seemed similar to some of the Rio Hondo pieces we've seen. A lot of these pieces were unmarked, or had paper stickers. This one could possibly be from Japan too, but either way it seems vintage. 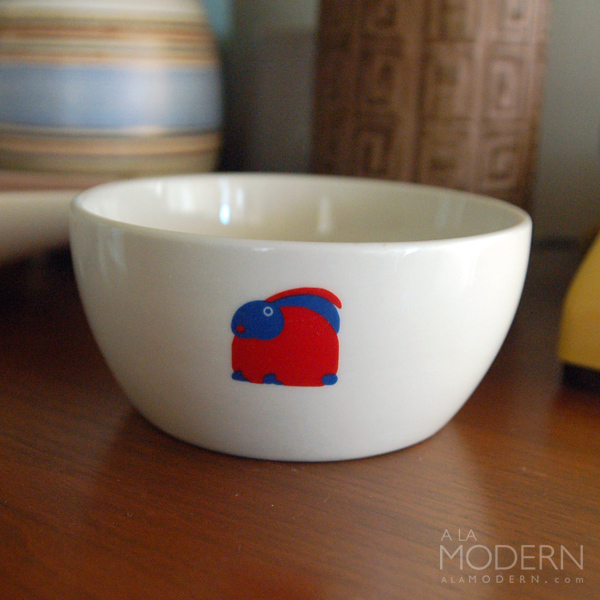 Continuing the rabbit theme, this Taylor & Ng "Minimals" bowl was an unusual find. We usually find mugs in this line - I hadn't come across any bowls before. Taylor & Ng also does well in our Etsy outlet. I'm a bit confused about these pseudo-Hall shakers. 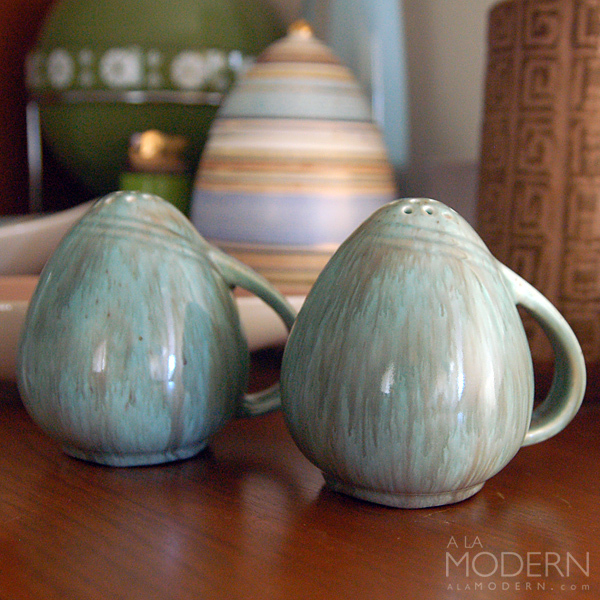 They have a nearly identical shape as the "Sani-Grid" pieces, but the blue drip glaze looks like California pottery. The material used is also white clay, not vitrified. Anyone know who might have made these? I have a Rosenthal plate with Raymond Peynet decor somewhere, though I haven't been able to locate it. 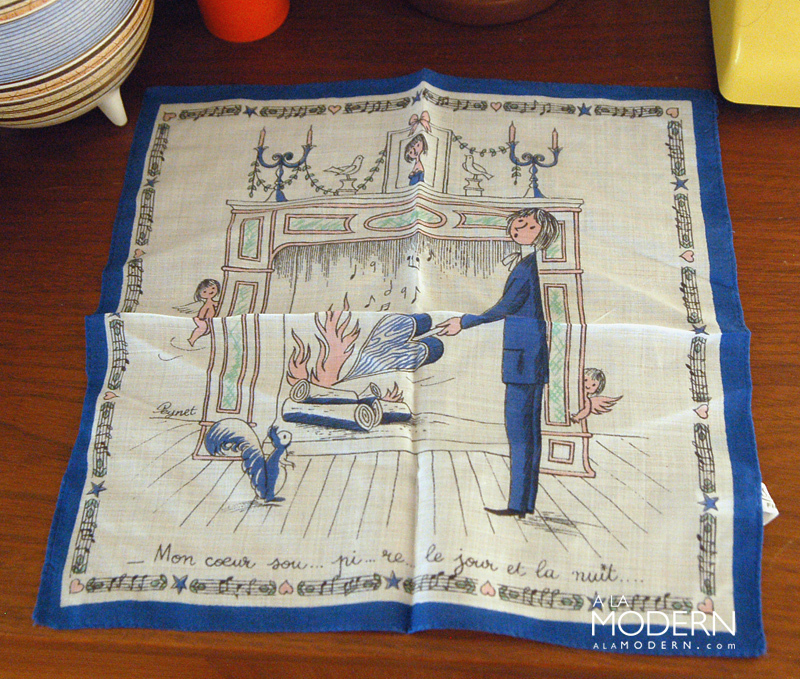 But this is the first time I'd seen Peynet on a hankie. This came out of an estate sale, and the lady had no idea about Peynet. I'm curious if these are harder to find or not - there's a tag that says "Made in France" and something like "Selection Mery..?" 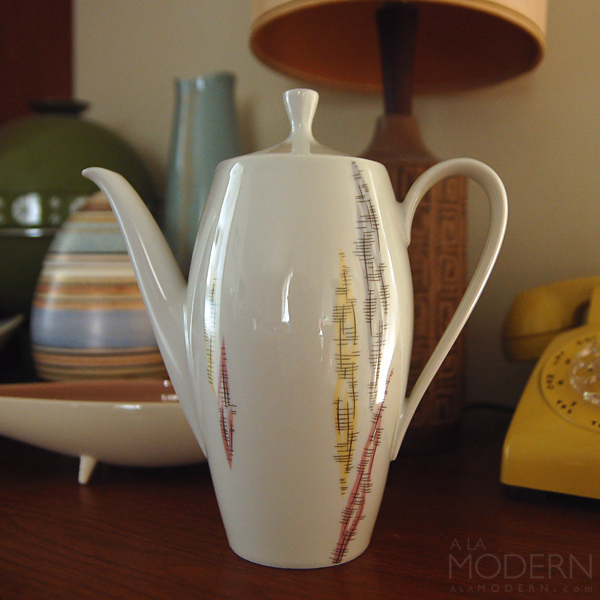 I picked up this Mitterteich Bavarian teapot because of the cool stylized leaf design. From the backstamp and overall look, I think it's likely from the 1960s. This teapot is actually quite small and slender - less than 7 inches tall. We haven't been able to find out the pattern name yet. 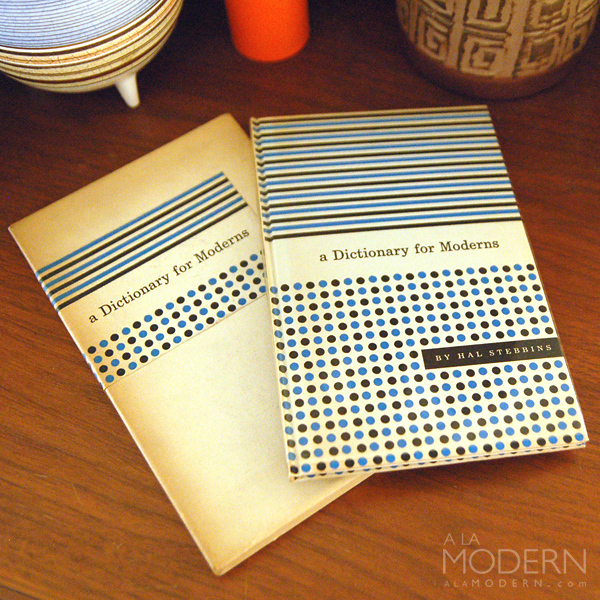 Lastly, this book is called A Dictionary for Moderns and was one of my favorite recent estate finds. It's a limited edition book from 1958, by Hal Stebbins, and it has a really cool cover design. The book actually has an outer box which it fits in. 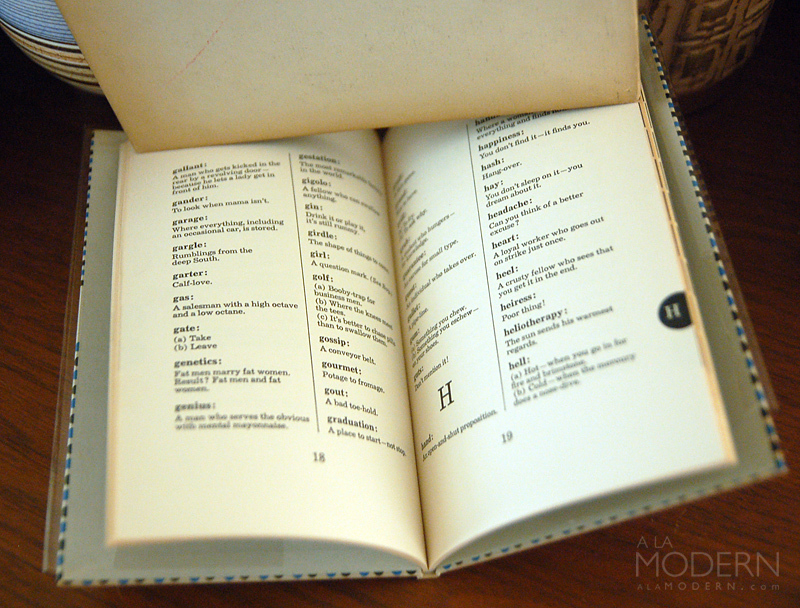 The "dictionary" is filled with tongue-in-cheek, witty definitions like the ones above. I mainly got it because I thought the title was cool, but it's a pretty interesting book as well. Stebbins also wrote one called "Advertising Almanac for Moderns", which makes sense because I think he was in advertising himself. Hmm... Mad Men? Hi everyone. We've got a full weekend ahead of us working on the new house, so I thought I'd squeeze in a thrifting post while I'm still at home. We found a few odds and ends for the shop - again, nothing extremely valuable. But we're still hoping our thrift scores will pick up in the coming months. I know that Mr. Owl's time in the vintage spotlight may have diminished lately (has it really? 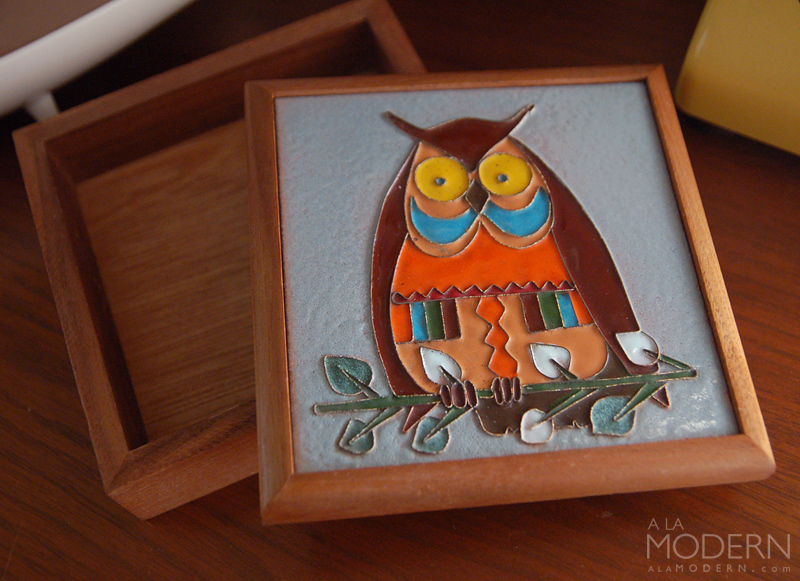 I keep hearing sellers say so...) but I couldn't resist picking up this nice enamel and wood box. No maker's mark that I could see, but just too nice to pass up. 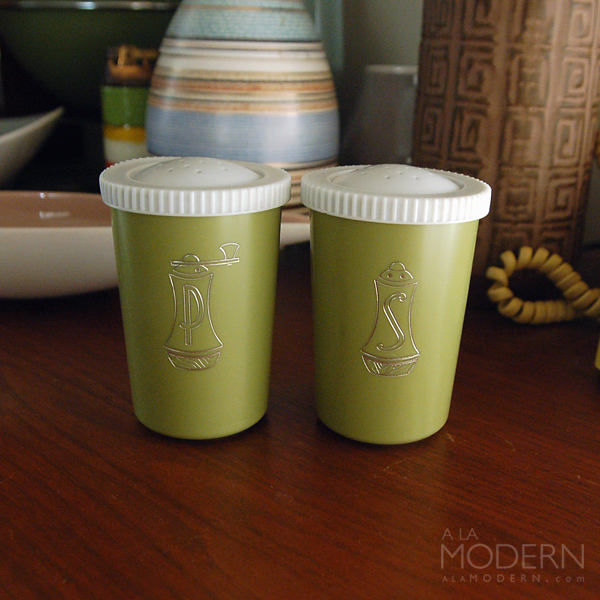 These fun and kitschy green salt/pepper shakers are actually from last week's thrifting. I'll often pass stuff up like this, but they were just in unusually good shape. I thought they might be tupperware at first, but they're harder plastic. 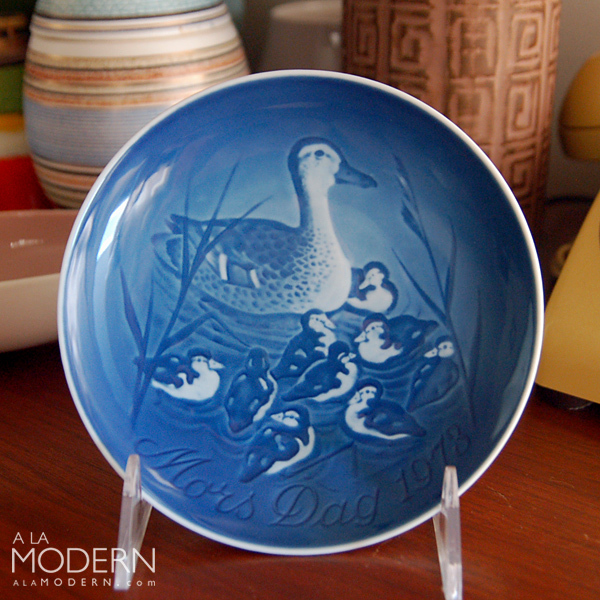 This Royal Copenhagen mother's day plate is another item from a previous thrifting run, and also another one that I've often passed up. These are fairly common, and the demand is low, so I probably should've let someone else get it. However, I just remember it was one of those thrifting days where you just don't seem to find ANYTHING. I don't know about other resellers, but I often feel a pressure to bring home inventory - in order to justify the time and gas money spent. So sometimes I'll buy things against my (slightly) better judgement... at least this plate was cheap. This is something I constantly struggle with - making smarter "decisions" for inventory. How about everyone else - is this ever a problem for you too? I'm very curious about these strange metal "sidecars", or condiment holders, that attach on the side of your plate. The guy I got them from said he thought they were for putting fish bones or other unwanted items (nut shells? shrimp tails?). 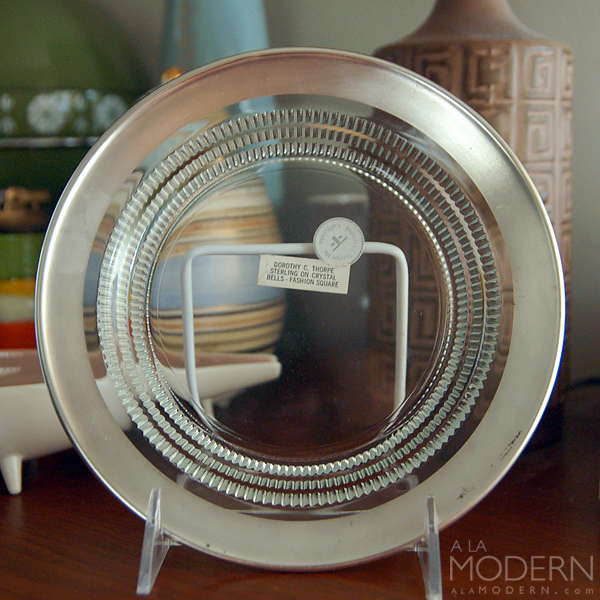 I got six of them and they came with a holding rack that looks a lot like the metal toast rack we have. Anyone know what these things are properly called? 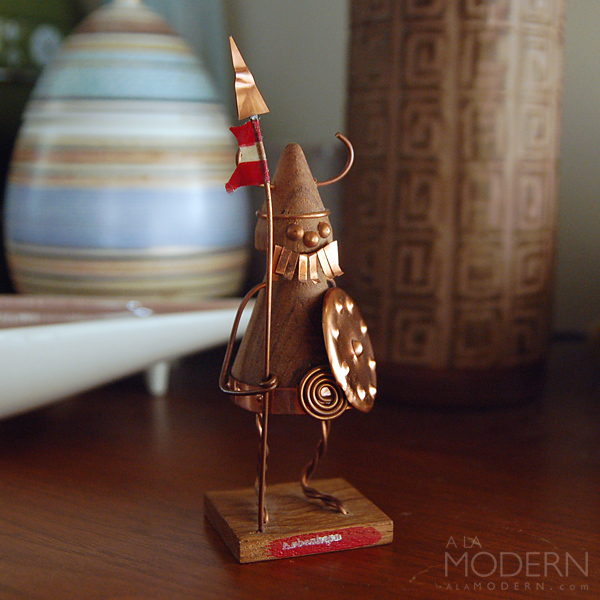 This wacky Danish sculpture thingy decided to follow me home. I probably shouldn't have gotten him, because I'm not sure that the copper would be that shiny unless he was a newer production. But the wood does appear to be teak (I'm guessing) and it's clearly marked on bottom with the designer: "Emis Butik". No luck on researching that name, however. I thought this was a tourist piece at first, but now I'm not so sure. 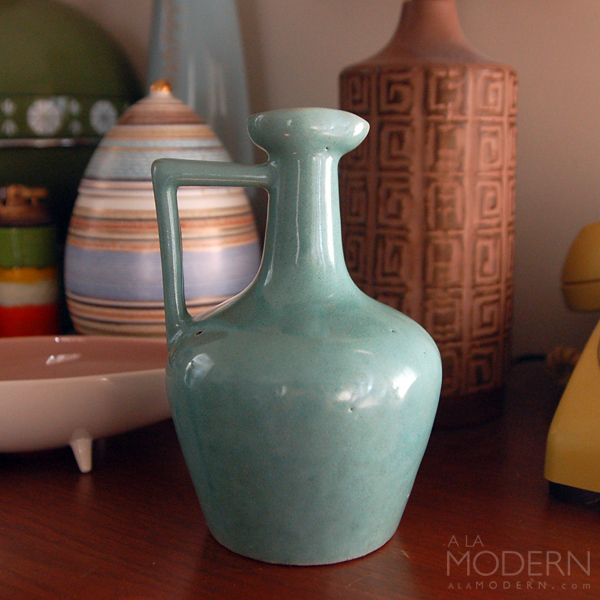 I was able to hit two quick estates this morning... one had quite a few midcentury modern items, but at quite high prices. I did manage to snag these two interesting Ben Seibel Jenfred brass ashtrays for a decent price, because they weren't marked. This is the 3rd time I've seen Jenfred, but the first two times, the items (a bigger ashtray, and a duck) were too damaged to buy. I always keep my eyes open for these interesting pieces, because some of them can be quite valuable. 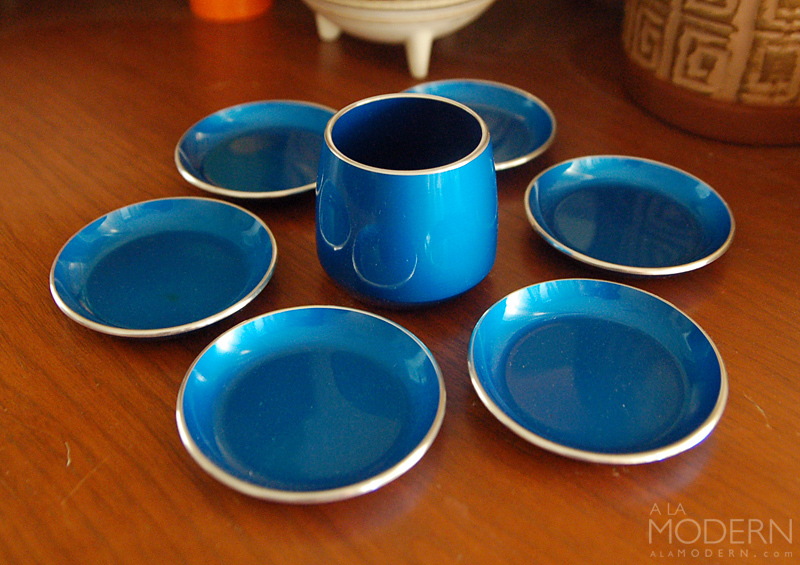 At that same estate sale, I came across my favorite item from this week - a small complete set of Emalox of Norway enameled dishes. I've never seen Emalox in such pristine condition. Not only that, but it came in the original packaging and box! It's strange, but we get a considerable amount of shop orders and inquiries from Norway... and several of those have been Emalox pieces. I really want to keep this set... but we'll have to see. All right, I hope everyone has a great holiday weekend. Happy thrifting!